Chemtrails are fact, not theory. The gov’t weather modification departments & the gov’t contractors who perform these services are on the internet & freely describe the project names & chemicals they use in the sky. 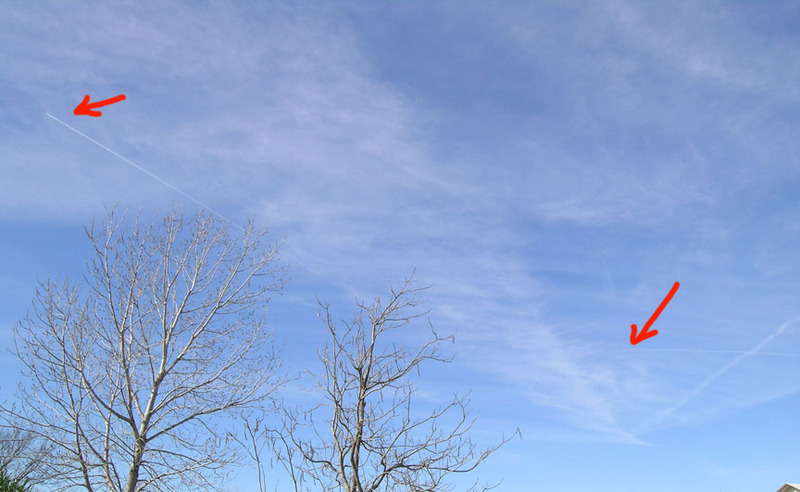 The difference between a chemtrail & a vapor trail is the lingering duration of the trail. A genuine vapor trail only extends a short distance from the plane & dissipates. It depends on how cold it is as to how fast the vapor dissipates. Chemtrails do not dissipate. They continue to spread into fine, wispy clouds until they cover the sky & thicken. Educate yourself. I have provided the sources & factual details. Think for yourself. Look up at the sky from time to time. I’m including these links at the top of this article so you can read the info directly from the official websites of the contractors and regulating entities involved with these US Government weather modification projects. That way, you don’t have to take my word for it. You can go right to the source. I also have a second Chemtrail article on this site. Here are the official links to one of the government contractors doing the weather modification projects. Project SPECTRA, PROJECT SUPRECIP, PROJECT HEAT and PROJECT PAPRICA. Who knows how many other contractors are working on more gov’t projects but they have to be listed for the public on some venue because it is being paid with TAX dollars. I’m also including the links to these “Official websites” because other people who had expressed concerns about this were being ridiculed… but these links to the US Gov’t contractors and State regulating entities will validate the veracity of those people who had expressed concerns about Chemtrails. You can read about the gov’t weather modification projects on the first link under the Overview of each Gov’t project this contractor is working on. The third link is on the State of Texas official website. This is the State agency regulating weather modification. These links are listed to validate the concerns of those people who were ridiculed and told there were no such thing as chemtrails. Read it yourself and then look at the photos below… after you learn about “Mineral Salts” in the next section. The gov’t contractor also claims they use “mineral salts” to seed the air in addition to the SF6 gas and the “aluminum coated fiberglass Chaff” which they claim are used as tracers. This is listed on their website link above. Doesn’t that make you feel warm and cozy? Ever hear of a deodorant called “Crystal?” They claim it is made from 100% mineral salts. It says so right on the package. It also claims to be Aluminum Free… that is a twist of words. It is only Aluminum Chlorohydrate free, not aluminum free. Look at the ingredient. It is Ammonium Alum. Alum is aluminum. Alum is a type of aluminum found only near sulfurous volcanic regions, also called “Potash”. Ammonium Alum is processed, not natural. Aluminum is a metal, not a mineral. I’m using this as an example of “Mineral salts” because Ammonium Alum produces sulfuric acid when mixed with water. (look it up on the MSDS safety charts). It not only tells you not to inhale or ingest the product, it also tells you to avoid contact with skin. Great idea for a deodorant. So, now we have sulfuric acid rain to go with the aluminum we are inhaling. Don’t you just love truth in gov’t and in advertising? 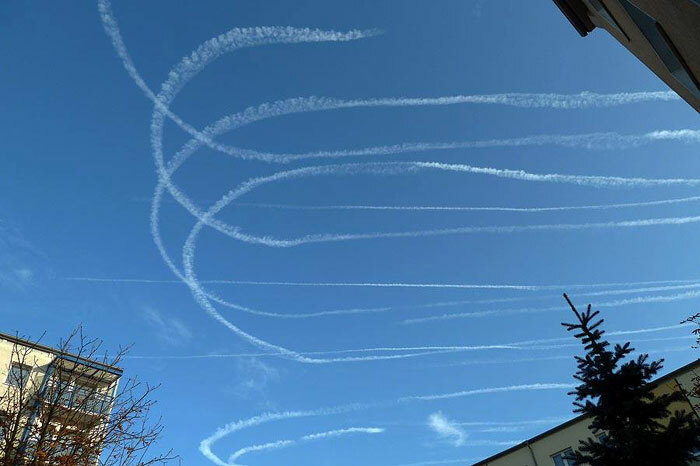 The contractor doing the weather modification projects probably has no idea what the gov’t included in the mineral salt mix so we can neither assume whether they know or not: But this is your American Tax dollars at work. You don’t want aluminum in your lungs or in your diet. (You might want to check out the ingredients in your pickles, antiperspirants, antacids, makeup, red dyes and any injections you receive while you are at it). Anyone receiving B12 injections? Aluminum is the preservative and the B12 is extracted from Cyanide. You might want to check any other vaccines, flu shots and any other injections you are receiving for aluminum or mercury as a preservative. Insulin uses cresol & phenol. Both deadly related toxins used in Lysol disinfectant which is deadly to pets & animals. Ask to read the vial…. don’t take anyone’s word for it and don’t let them give you this line about how small the amount is. There are compounding pharmaceutical companies such as Paragon who can make the shots without preservatives and without cyanide and for B12, you can learn to do your own shots or have a spouse do it for you… however, the compounding formulas will cost you more and your insurance won’t pay for it. A cost difference similar to $20 for the bad version and $450 for the good alternative. And if you see a news report on how a certain product will reduce your chances of cancer or other diseases or a lab testing the safety of any product, you might want to check and see who paid for the research. These studies conducted on various products are always paid for by somebody. Even at the universities who depend on gov’t and private grants to fill their coffers. Someone always benefits from these tests and studies. I also know of a Director of Research who was pressured to keep their mouth shut about the pet food contamination. I spoke with this person myself. There was a lot more than mellamine in the petfood and it wasn’t added in China. There were internal lesions in the pets which was not attributable to mellamine. They found more than one contaminant and were threatened to keep silent. Those researchers had also lost some of their own pets to the poisoning. There were tens of thousands of animals who died from it. I had 8 pets who died from that tainted food and it was taintend years before it was announced and did not stop when they said it did. I was still losing animals months later. So imagine how many other pets died. The FDA was receiving tens of thousands of calls each day… but they will just say we have to PROVE it. It doesn’t count unless we can PROVE it. And even if we do, they’ll find a way to discredit that. There is a lot of money in corporate politics and our fearless leaders are all bought and paid for. Consider buying your petfood from “Solid Gold” Katzenflocken and Hundenflocken. The only safe food I could find. It is sold at Petco and online at Amazon. I have not lost any animals since. The head of the USDA and FDA during Bush “W’s” administration owns the largest meat packing plant in Texas. Even worse, it also does poultry on the other side of the building…. cross contamination. I was told this by someone who works for the FDA in a fairly high position. And the USDA is trying to block all packing plants from testing for BSE “Mad Cow disease”. If you don’t test for it, then they can say they have not found any cows with the disease. A packing plant owner in Kansas was sued by the USDA for wanting to use his own money to test for BSE on cows coming into his plant. The USDA claimed they had the right to decide who and when the testing could be done. The USDA lost in April 08 but had until June 08 to appeal. You can find this info on the news articles online. Imagine the concept of not being allowed to test for a disease at your own expense? There were three FDA inspectors who blew the whistle on a meat packing plant for using obviously downer cows with BSE and processing them without testing them for BSE… again, if you don’t test, you can’t prove it. Feeling better about your food safety yet? This same man over the USDA is also over the food and drugs…. you might want to sign up for FDA alerts and read about all of the recalls of food, meat and medical products which are never announced on the news. You never hear about it but it is a daily occurance. Go onto their website and read about the meat and food recalls for the past year and even farther back. Educate yourselves on the facts buried under the facade. What is really disturbing is that these weather modification spraying projects are not limited to the US. Our gov’t is paying them to spray the middle east, the areas around Turkey (anything to eavesdrop on the Russians) and there are people living in the UK complaining about US planes spraying their skies as well. I believe them because I saw a photo of Belgrade Ireland someone posted on Google Earth and it had the very same type of chemtrails in that photo which are shown in the photos I posted below. The photographer probably never realized what was in the sky on his photo. Most of us don’t. I wonder how long I did not notice the trails. When I first saw the Chemtrail DVD, I thought they were goofy in the head until I saw the very same thing occurring over our area and started looking into it, researching and finding irrefutable proof of these activities on the internet links I posted above. So in addition to our US Tax dollars being wasted spraying half of the world (and a tank of passenger jet fuel was $55,000 ten years ago… so imagine what the fuel costs now?) our gov’t has decided to ruin the rest of the planet as well…. while telling everyone that there is no such thing as global warming… sure. That is why all of the ice in the arctic is supposed to completely melt by Sept 08. I’m not any smarter than anyone else and being an engineer does not have any bearing on anything. And I don’t make any of this up. It all comes from reliable sources. The difference is that I read. I read everything and research everything. I read every label and never assume the same product will have the same ingredients each time I buy it. (I have to. I’m allergic to everything.) If I see a word, or terminology or ingredient I am not familiar with, I look it up and research it. I’ve done this since I was a child. I have read dictionaries and entire sets of encyclopedias from cover to cover. I research every medicine before I take it. I read the MSDS on any product I buy, especially construction materials such as treated or glued wood products, carpet and flooring materials and glues, paints, plasters… you name it. I was responsible for employee and equipment safety and quality and construction projects. I don’t use anything which is oil based or contains solvents and will not use anything which cannot pass California standards on product safety even though I do not live there. I never make a statement about anything unless I have read and thoroughly researched it. I always have sources and references to back up anything I say. If I can’t find enough info in books or online, I will also directly contact researchers and universities for additional info on subjects. So, if someone has doubts about anything, they can go directly to the source of information and check it for themselves. I think that is a lot better than listening to a bunch of nuts ranting because they don’t like what you have to say. Genuine vapor trails are exactly that. Vapor! And it dissipates within minutes of the plane passing over. It simply is vapor similar to fogging up a mirror. Genuine vapor trails completely dissipate in just a few minutes. Chemtrails do not. 3 members of my family were aerospace engineers. Two others were pilots. Having lived quite a number of years near several aircraft companies… vapor trails and sonic booms were daily events. 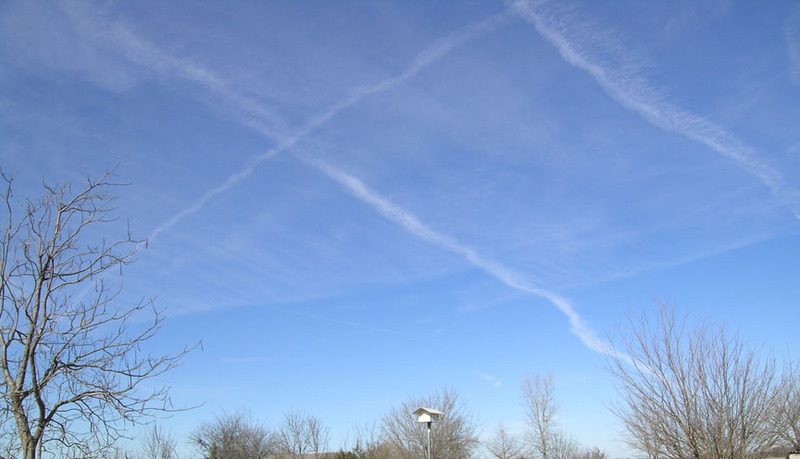 There is a clearly defined distinction between vapor and chemtrails. And as I am writing this, they are out there doing it again but more in a random mode than a grid this time. Perhaps they are trying to make it look more natural. I also have video of genuine vapor trails. The gov’t is paying contractors to spray SF6 in addition to aluminum coated fiberglass chaff which they claim is for tracing. SF6 Sulfur Hexafloride is the number one worst gas for global warming. (Go to Wikipedia to read about the SF6 info I am including). SF6 is 3200 times more damaging than CO2 yet the US gov’t is freely spraying tons of this stuff into the air every day and is a violation of the Kyoto treaty. See the links at the top of this post so you won’t have to take my word for any of it. Just read the links and look at the photos. The times between the photos are exact to the minute. My camera records the data for each image. Make sure to note how many minutes it is between the photos because this is how fast these chem trails spread into creating overcast skies. The faster they spread, the less likely people will notice. When they started spraying the chemtrials we had a crystal blue sky on most days. They did this 7 days a week, every week including holidays such as Christmas day, Thanksgiving day and New Years day since at least Aug 07 which was when I first noticed them. They did not miss any days and this went on for months and months until March 08 when they became more random. As I mentioned, I found the websites for some of the government contractors doing this who are only too happy to tell you on their website as to what and where the gov’t has them spraying. I will include the links to the gov’t contractor and other info you can look at. 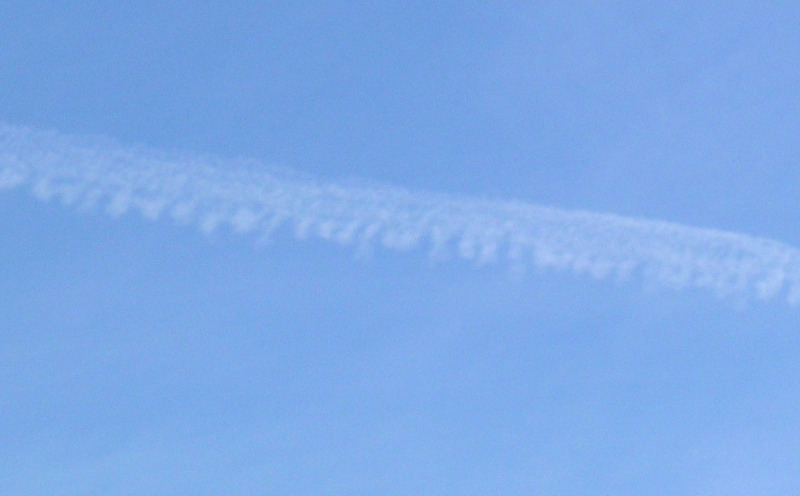 On these chemtrails, notice how they extend from a single point outward like an oriental fan. The convergence point is the fueling point for the planes. In this case, it looks like Tinker AFB may be the point of original. The trails extend outward from the fuel point like sun rays. Then you will see a cross over trail cutting sideways across the fan shaped rays. 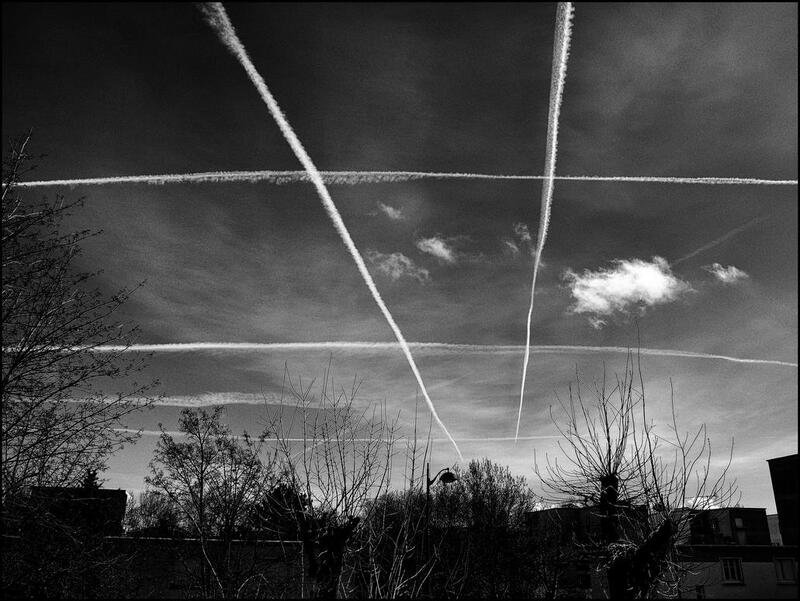 I see this pattern in every chemtrail photo from the US to Paris to Ireland and Saudi Arabia. Note these trail pattern curiosities in my photos below taken from my own back yard. Look closely to see the dim crossover trails. Here are some additional interesting trail photos online. Photo above is looking toward the north west. (Arrows point to two planes adding more chemtrails to the sky). Same location 10 minutes later! See how the trails spread out! The image above is also looking slightly to the north west. Notice how quickly the trails are spreading out in only 11 minutes. The entire sky becomes totally overcast after they do this. Thie image below is a closeup of one of the chem trails just beginning to spread. Notice the puffs along one edge of the chemtrail likely caused by the chemical dispenser. If it was the engines, it would be the same on both sides and unlikely since jet engines run smooth and consistent. Only a pulse engine or a pulsing dispenser emitting measured doses would cause this type of trail oddity. Close up of chemtrail. Notice puffs on one side as it just starts to spread. This next image below is the same area looking to the east on a different day where their spraying created some angry storm clouds in perfectly matching neat rows which were made by chemtrails. Why is the US government deliberately spraying SF6 over the US and many other countries across the globe? Are they deliberately trying to create a total meltdown of ice in the next couple years? That will really tip our axis. This next image is really weird. I thought I would include it because it was so strange. 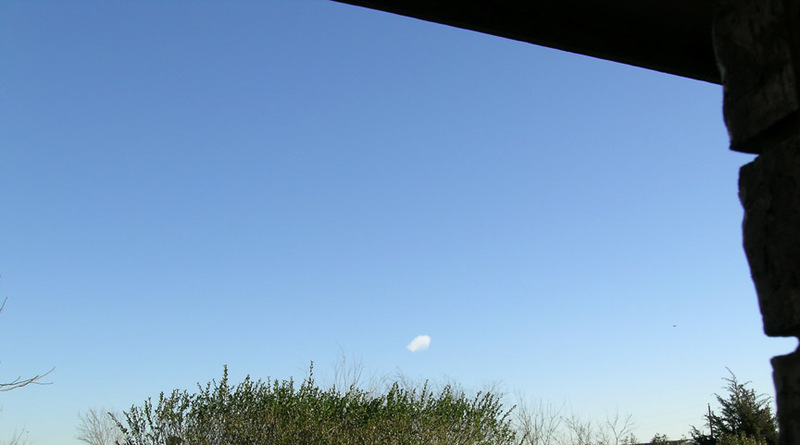 This photo was on a different day and this one solitary puff of cloud appeared less than 100 ft above the ground over us while the entire sky was clear. 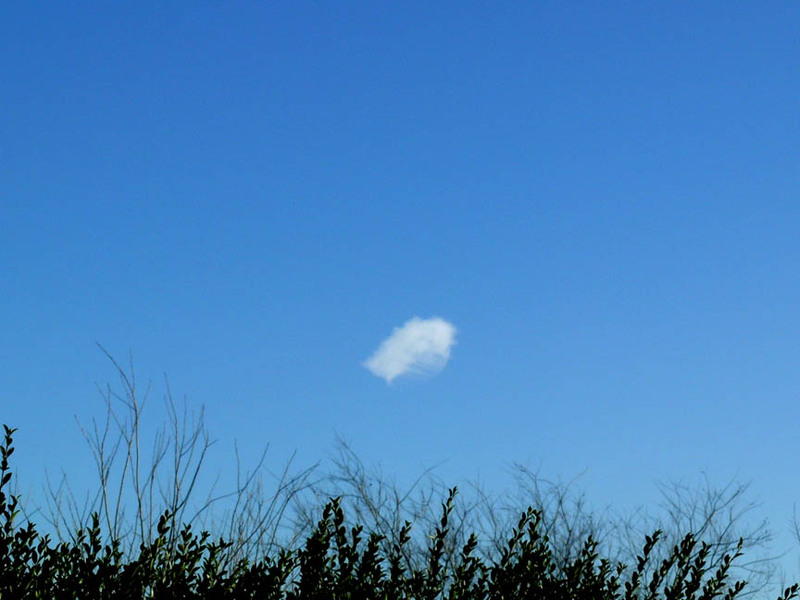 This little cloud was so low you could probably touch it from the top of a 3 story building. It was possibly as low as 50 ft and did not move like a normal cloud pattern. This is open country… so nothing to cause it. It hung over us for an inordinately long time like a balloon on a string, then eventually drifted slowly away… still low. At the time, you could see a white powder silting out of the cloud. There were no other clouds in the sky. This was not vapor or steam or chimney smoke. Here is is again, finally drifting away hours later. I copied the remaining photos from the internet & pasted them below. I tried to select genuine chemtrail photos & not the Photoshops. Over Paris from the link near the top of the article. An unusual pattern in Europe. Everyone has their own styles. A standard fan pattern with crossovers as shown on my photos. It is too bad they didn’t photograph the successive development of clouds as my photos show. Don’t let some moron tell you these are vapor trails. If they don’t dissipate in minutes a short distance behind the planes, they are not Vapor trails. 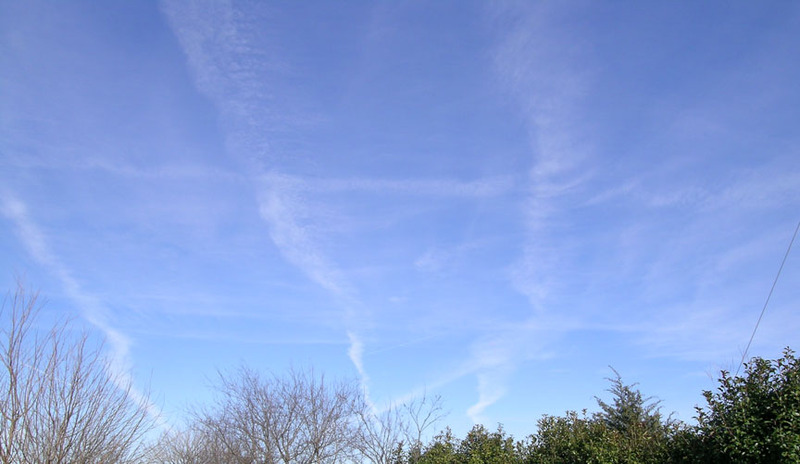 You can visit the gov’ts & contractors websites to read about the spraying of weather modification chemicals. Anyone who says otherwise is just a loudmouth bully or hireling trying to deliberately confuse the public. Especially victimizing those who are too dumb, gullible or lazy to take the time to look up the facts. Don’t let anyone bully you into submission or do your thinking for you on any issue. Don’t waste your breath on them either. I don’t allow bullies & hirelings on my sites. I protect those 120,000 who follow this site. The bullies & hirelings are beyond redemption & feed off the control of others. Well meaning friends, neighbors & relatives can also become controlling. It is better to remove their control so you can live your life in peace without someone else trying to control it. I had to do this. The first year can be hard but quite peaceful after that. Meet new friends who are supportive, not controlling. Better to have a good listener than dictators in your life. I include links to official & reputable sources so everyone can verify the facts. The gov’t & contractor sites clearly tell us they are spraying chemicals to modify the weather, which chemicals they use & the name of those gov’t projects which pay for it. They admit what they are doing. So why is there any doubt except from fanatics whom have no idea what they are talking about. This is an honest site & I provide reference links to support any info I offer. There is no false data on here. Think for yourself. Check out the links & read for yourself. Learn the truth about things. Two days ago, I noticed the jets were again flying grids and leaving Chem trails. NOT vapor trails. My parents were Aerospace engineers for Boeing and Pratt & Whitney. I clearly know the difference between the two trails. Vapor trails disperse rather quickly. Within minutes you can see the vapor trails degrading. Chem trails remain for indefinite periods but they spread out and become wider into thin clouds. This process continues until they actually become a full cloud cover… which is why I posted photos so you could see the process and check the websites of the companies and government entities involved in the process and read about the chemicals involved. Clearly, the chemicals are bad for the animals outside, as well as the water and crops they contaminate. Not to mention the horrendous expenses involved in paying for the jet fuel not to mention the chemicals, pilots, crews and contractors gouging prices. Based on fuel and pilot costs, I would guess nearly $100,000 per each flight. However, this time, I would like to say something positive about the chem trails. Northern Texas in the Dallas area is extremely hot and DRY in the months of July and August. The triple digit heat is unbearable and usually lasts for 2 months without a break. It rarely ever rains a single drop in the months of July or August… unless a slight overlay from the end of June. But (yesterday) the day after I saw the chem trails it poured rain. In fact, we had heavy rains 3 times this past week. Very uncharacteristic… but a welcome change. In truth, the chem trails weather modification projects do cool down the miserable temperatures and bring us much needed rain. Where last year, we were allowed to burn up in a drought so bad that our grass completely died… roots and all. Not just the surface. Only dirt for a year. Nothing to grow back when it finally rained after almost 8 months without a drop. Keeping in mind that the rainfall records do not show the different levels between the different counties and areas. 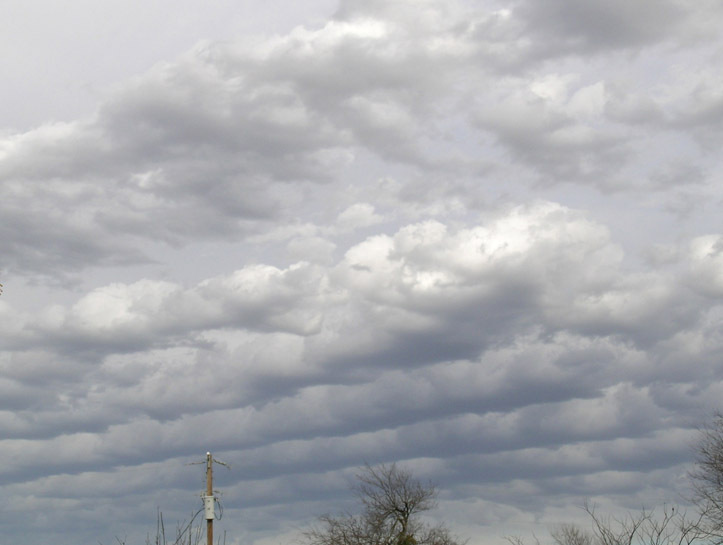 While it may rain south of Dallas once a week… it may not rain a drop near Van Alstyne or Anna for months. The reports do not show these areas of devastation or even recognize they exist. I finally installed my own weather system which records all the precipitation, winds, humidity, wind, temperatures, etc. But this year, they decided to start the chem trails again. Probably because GWB decided to live in Dallas. So we have 6 ft tall weeds from all the rain… because the grass died last year. It was the first time the roots died leaving us with nothing but dirt. We need to reseed but not until the weeds are gone. Actually, the chem trail flights stopped one month before GWB moved here at the end of his term. No, I’m not a fan. Very few people were, even in Texas. That was the crooked digital voting machines which coincidentally, they also make here. You should read the serious problems with those in the old newspaper articles around election days here going back to 2000. We even had an election worker who stole the primary ballots and was chased across the county by police trying to stop our current leader from being elected. Nearly 50 % of the residents north of Dallas moved here from California to get away from high prices. They clearly are not fans of GWB. Only the crooked voting machines make it look that way and no one seems to do anything about the complaints. But I’m addressing the chem trail issue, not the politics. However, it seems to be the residency choice of that politician which affects our chem trails here. He shut them off a month before he moved here at the end of his term in 2008. But, I guess GWB finally had enough of the droughts and got the chem trails turned back on again, bringing us desperately needed rain and relief from the triple digit heat we usually suffer from in July and Aug nonstop. It indicates he knows about the toxins but finally had to choose the rain and reduced temperatures over the chem trail toxins. While I don’t care for the aluminum and other bad products being used in the chem trails, we need the rain and a break from the heat caused by our axis shift. But it is a case of which evil is worse. The chemicals or the triple digit heat and 2 to 3 months without any rains. I just noticed that several of my trees and bushes are dying. Even the weeds are turning yellow despite the pouring rains. It hasn’t been that hot. There are no other toxin sources or insects or disease going after the plants except for a fairly large amount of grasshoppers. However, the grasshoppers are not causing this damage which is yellowing and withering the entire plant and tree. There is no evidence of chewing or boring or disease or root damage. No boring bugs or anything else I can find. I have not tested the trees and plants but I suspect the chem trail chemicals may be behind the sudden dying of trees and greenery which only began a few weeks ago after the chem trails restarted. If I had to choose between the Texas triple digit heat waves with 3 months of zero rain each summer or the toxic chem trails to cool it off and provide rain… I would unfortunately have to choose the chem trails and remain indoors. But I wish our scientific community would come up with another method without the toxins. These toxins are bad for people, animals, water sources, food crops, trees and grass. I highly recommend using steam distillation for your drinking water and scrubbing your produce and peeling the outer layers to get rid of as much contamination as possible…. and grow your own in makeshift greenhouse nurseries if you can… but don’t forget to filter the toxins before watering them and ensuring there is a plastic barrier above the plants to protect them from the toxins being sprayed. The websites describe the chemicals they are using and the name of the gov’t projects funding them. I am however, not very happy about us paying for the chem trail spraying of other countries like Saudi Arabia and the UK and wherever else they are spraying. Let them pay for their own problems instead of gouging money out of our medical care coverages and senior citizens to waste on foreign countries. I was not able to measure the sun last month but just looking at it today, it appears we are even farther south than the last few years. We may be developing higher humidity levels and weathers from a semi-tropical climate as we are shifting south. I found it interesting that our downpours yesterday were moving from East to west…. backward. If you look at the weather satellite imagery, you can actually watch the storms forming just to the northeast of Dallas… where the jets were spraying the chem trails the previous day. So the weather modifications clearly work. We will also have higher humidity in the summer and heavier precipitation in the winter as long as the polar regions and glaciers are melting. But once they have completely melted, in addition to the ocean levels rising, our air will become very dry after there is no more evaporation creating humidity and precipitation. Yes, we will have ocean evaporation but there is a density difference with salt water and the ocean temperatures are not as effective evaporation sources as the runoff water on land and in heat zones. But be sure to go to the National weather site and check out the weather satellite images for northern Dallas on Friday July 19, 2013. I don’t remember the time. I think it was afternoon but check Thursday as well… just to be sure you find the correct day. You can watch it forming just about 40 miles or so… NE of Dallas and flowing backward across the area. I followed it on radar at the time. These may look like small storm clouds about 10 miles wide… but they carried a lot of rain which just poured over us. 2 inches in just a short time and formed directly from chem trails. I saw several jets spraying chem trails on Thurs morning. They always remain high above the local air traffic control hub to avoid the normal air traffic patterns and usually originate from the same point in OK. Probably Tinker. So this backward rain forming over near Hunt & Collin counties was after the chem trails on Thurs morning 18th. There were probably a lot more days just judging by the rains, but I haven’t been keeping track and that was the only day where I looked for the trails and saw at least 2 forming the usual grid patterns I have witnessed over the years and taken photos of which some I posted here.